Last Sunday was my friend Rick’s birthday. But two weeks earlier, his car’s odometer reached 200,000. Which matters more? 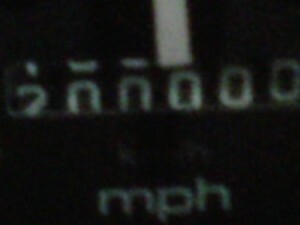 I know about the miles because he took a picture of the zeroes turning with his BlackBerry and sent it to me. I imagine he did that because the car used to be mine. It’s a 1995 Honda Accord EX wagon; my wife and I got it new. Rick took possession at 90,000-some miles, and drove it home to North Carolina. And has driven it and driven it and driven it since. He told me that a bit of leaking oil is the car’s only real problem. I admire him for this, in part the way I admire people like cab drivers on the West Bank who keep their old Mercedes wagons going and going and going–far beyond 200,000 miles, I would guess. I imagine that driving a car this long is a more “green” thing to do than driving a hybrid car, which I do. If I’d kept the Honda, the earth would have been spared the manufacture of my current car. As people who drive a lot, we measure our lives in miles to some extent. Rick has had a lot of old cars. In fact, at his rehearsal dinner, I toasted him by remembering several, chief among them the AMC Gremlin. The Gremlin would not shift into reverse, and so Rick tried hard to avoid any situation that might require it, such as driveways and parallel parking–in fact, most parking–because to move the car backwards, he’d have to put it in neutral, climb out of the driver’s seat, and push it backwards while trying to steer. But Rick’s ownership of the Accord is, to me, a measure of his constancy. We go back to college; he took the author photo of me for my book Coyotes. He keeps things a long time. Delightful to read about Rick’s milestone. I remember the Gremlin story. Just the other day, I was telling somebody my own car horror story: the old VW wagon with the brakes that wouldn’t work. Once sailed through that four-way stop near Boltwood. Surely Rick will read this and know that I wish him a happy birthday. His car, too. I keep thinking of replacing my 2001 Lexus but it has only 90,000 miles on it so that will not happen. My frugality, honed by the 2nd world war, is such a part of me that the moment I think of buying a new car, I shudder– it would hurt my bank account as well as my sense of right.